SUSU IBU & ANAK ANDA: Breastfeed Both an Infant and a Toddler? Some mothers express concern that their toddler may be taking milk meant to nourish their baby. These mothers may take comfort in the fact that breasts are marvelous things that can adjust their production to meet the demands placed upon them--if they are asked to produce enough milk for two, they usually can! Also, most toddlers breastfeed considerably less frequently than an infant, and get most of their nutrition from other foods. Many mothers find that children who tandem nurse are closer with each other than children who do not. It is normal even for mothers who choose to tandem nurse to sometimes wish they weren't so tied down to two babies or to want to breastfeed only one baby at a time. It is often the case that a baby or toddler will want to breastfeed much more often when a younger sibling is born. Many want to breastfeed every time the baby does. Many mothers suggest allowing this for a period of perhaps three weeks. After that time, try telling the older child that you prefer to be able to really pay attention to him/her while breastfeeding, and request that he/she wait until the baby is done before he/she breastfeeds. This will not eliminate the constant double-nursing, but may very well cut it down. 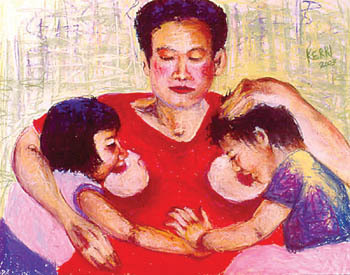 Many mothers have found that tandem nursing is a good way of meeting the needs of both children.